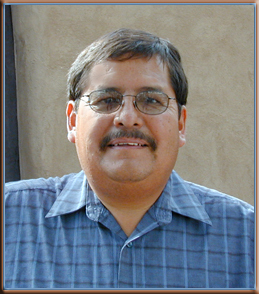 Born Ramon Albert, Jr. (a non-Hopi surname), his grandmother gave him the name Dalangyawma, a name of the Greasewood Clan. As a young man, he attended school in Santa Fe and served in the US Marines. Ramon began his silver working career in 1978 at Hopicrafts then located near the village of Hotevilla. His designs come from his experiences in life - clouds, thunderbolts and rain - important in an area with no irrigation for crops; and bear, spider, antelope, prayer feathers, kachinas, kokopelli, corn - the clan religious symbols, the basis of Hopi life. Ramon's work is characterized by the very heavy weight (thickness) silver he uses and his laser like precision in cutting out his designs and meticulous background stamping - nothing but the highest quality. He is a very fine man who we are proud to call our friend! Ramon uses his name stamped into the reverse of his pieces as his hallmark. Earlier examples of his work were marked with a composite RA. Ramon and his wife Mavis live in Hotevilla. Their son Cheston, was honorably discharged from the Marine Corp and is attending Arizona State University where he is studying Criminal Justice. 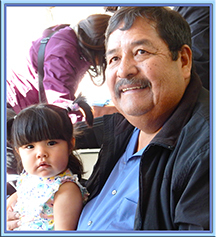 Shown here is Ramon and his grand daughter Tawavensie at the Heard Museum show in 2018. Can you tell Ramon is a very, very proud Grandpa (that is "Da" in Hopi). We are pleased to know Ramon and share examples of his extraordinary talent with you. ©2000 - 2019, Southwest Traditions, all rights reserved; this page or any part thereof may not be duplicated without express written permission of the copyright owner.